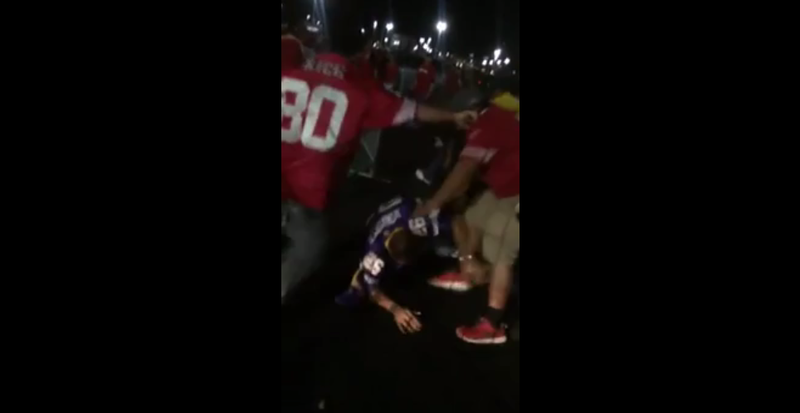 Yesterday, the Santa Clara Police Department announced that they had arrested four people, three men and one woman, for felony assault for Monday’s parking lot beating at Levi’s Stadium, where a handful of 49ers fans kicked around a Vikings fan in an Antoine Winfield jersey. The suspects include Felix Chavira, who is wearing the #28 49ers jersey in the video, Juan Arias, wearing the white jacket, and Eric Martinez, who has the Jerry Rice jersey on. The fourth was a minor. SCPD say they primarily used the video to find the suspects, and that injuries sustained by the Vikings fan and a security guard are non-life threatening.